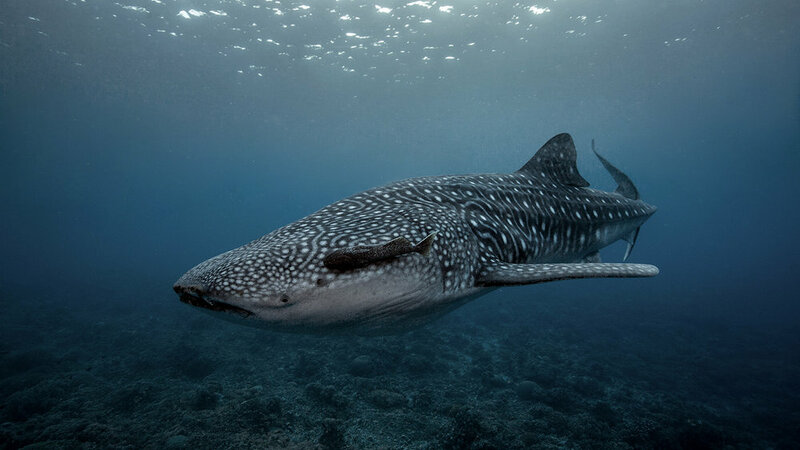 Scientists in Japan have discovered that whale sharks may not be entirely carnivorous – and instead consume significant amounts of plants and algae. Conventional wisdom has been that whale sharks, like other sharks, exclusively eat other sea creatures. The largest fish in the sea (about a school bus in length, and weighing more than 20 tons) were believed to subsist entirely by filtering massive amounts of tiny prey, like krill, fish eggs, and the occasional squid or prawn through their mouths and gills. The new research suggests they instead eat a mix of fish and sea plants, and more puzzlingly, periodically fast. Whether this is by choice, or because they can’t find enough food, could have implications for conservation. Already, whale sharks are classified as endangered by the International Union for the Conservation of Nature, as their numbers have decreased thanks to human activity, like offshore oil drilling, tourism and fishing – they’re sometimes accidentally caught and killed in commercial fishing nets, and hunted illegally for their meat. In the Philippines and other parts of Southeast Asia, the plastic problem is being compounded by a nefarious kind of plastic packaging that took off in the 1980s — the sachet. These plastic pouches are often bulked up with layers of aluminum or paper for shape or durability – think of ketchup packets at a fast-food restaurant. NPR has a good long read about the wider problem, and one resident’s efforts to hold big global brands accountable. In the Bahamas, where conch shells are a vital part of the culture and economy, the sea slugs that create them are finding it increasingly difficult to reproduce. Overfishing and loose regulations have pushed many pockets of conch communities below the critical level needed for mating, according to recent scientific surveys. That means conchs in those regions may die of old age without reproducing, possibly in as little as ten years. Israeli scientists have created a process to make bioplastic polymers that doesn’t require land or fresh water — resources that are scarce in much of the world. The polymer is derived from microorganisms that feed on seaweed, is biodegradable, produces no toxic waste and degrades into organic waste. Unlike other methods of making polyhydroxyalkanoate (PHA), the new technique can use very salty water and doesn’t require plants. Another surprise in the climate struggle – it turns out that the business of saving lives is part of the problem. In the US alone, healthcare accounts for nearly a tenth of the nations’s greenhouse gas emissions. Lifesaving equipment like CAT scanners, respirators, and dialysis machines have huge energy demands, currently met with fossil fuel energy, and hospitals also produce about a pound of hazardous medical waste per bed per day.